In 3 days from now as I prepare to add another number to my 30’s I put to test a new beauty product in town. This product I was told promises to help you lose upto 6 kgs & 10 Inches in just 6 weeks! More over helps break down cellulite and tighten skin. Wow I think! This is the answer to my 30’s prayer. Honestly, truth be told they did have me at the word SLIMSONIC, I needed little or no convincing at all. As the appointment day came close I was a bit nervous and excited however walking into the VLCC Wellness Centre put me right at ease. From a warm hello at the reception to being handed over to skilled, friendly nutritionist I knew I was in good hands. My first impression of the clinic was – Well Equipped. And I just don’t mean that because of the fancy hi tech upto date technology I am talking about the human factor. Step 1: I stripped off all the extra weight of my clothes and changed into an unflattering robe that was in reality guaranteeing me flattering results. 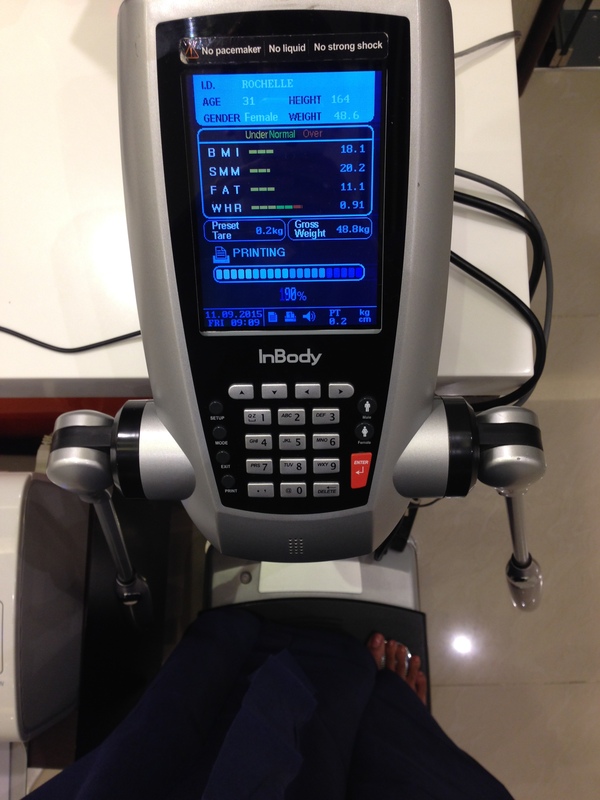 Step 2: I then stood on a weighing machine that dint just tell my weight but my body mass to water content to muscle mass to protein and mineral % . It then printed out a sheet after assessing my body completely, all this in a matter on 5 minutes. The nutritionist evaluated the chart and decoded the medical jargon for me, explaining what each result meant. Step 3 : As scary as this simple procedure of Measurement is it is vital in evaluating final results. My body was measured from Neck to Thigh and Arms too. This gives the technician a fair idea of what parts of the body to concentrate on while performing the Slimsonic treatment. What is Slimsonic? 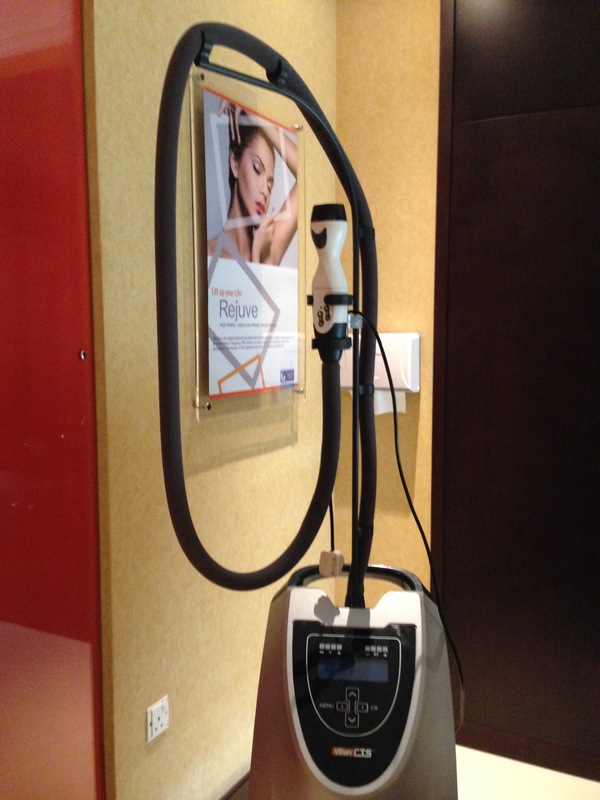 It is a simple aesthetic system that incorporates the Revolutionary CORE Technology using radio frequency combined with Vacuum Therapy to deliver cellulite reduction, body conturing and skin tightening. The procedure is comfortable and technicians always talk to the client about pain thresholds and comfort levels. The non invasive procedure simply increases blood circulation, stimulates lymphatic drainage and assist in shrinking the fat cell volume. I was told by my technician that CORE Technology deploys heat into the body in 3 different radio frequencies that target different tissue depths while distributing itself accurately traveling through all of the skin layers. This process also assists in breaking down rigid collagen along with helping its production and secretion that stimulates fibroblasts enhancing the elasticity and hence resulting in skin tightening. All procedures end with a light massage to help push out the fat to the areas that will then help break them down into energy. It is also highly advised to engage in a short work out after the procedure to help get the best results. This process in total took about an hour and the technician concentrated on my tummy area. Technicians advise to do this procedure only once a week so that Collagen produced is used up by the body. A variety of packages and discounts are available at the wellness centre. What I like most is that VLCC Wellness does not believe in one size fits all motto and treats every single person individually so that they are able to provide clients with the best results. Family packages and consultation is also available. Next up we’ll be talking Hair and skin and all the amazing technology that can help you listen to what the body is screaming out from its pores! Oh interesting! I totally want to try this out but I have like a million questions! Hello. I am so interested to lose my lower belly fat/loose skin. I am lean but have a lower belly fat bulging and loose skin. 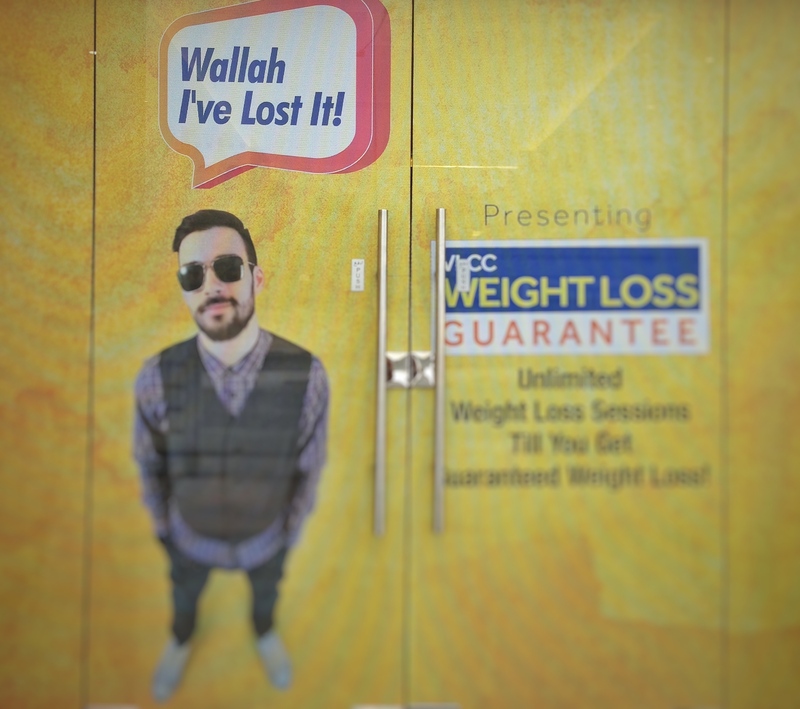 Do they suggest many sessions or does it depend on the body mass index? Looks interesting. Curious to know if you went again? And if the inches lost were maintained? Hey yes I did once more but thats it. I do think every treatment in combination with healthy living and some sport does helps achieve such goals. I’ve heard the LPG endermospa at Al Waab is also very good.